For the first time, physicists have experimentally demonstrated a quantum secure direct communication (QSDC) protocol combined with quantum memory, which is essential for storing and controlling the transfer of information. Until now, QSDC protocols have used fiber delay lines as a substitute for quantum memory, but the use of quantum memory is necessary for future applications, such as long-distance communication over secure quantum networks. The researchers, Wei Zhang et al., from the University of Science and Technology of China and Nanjing University of Posts and Telecommunications, have published a paper on their experimental demonstration in a recent issue of Physical Review Letters. QSDC is one of several different types of quantum communication methods, and has the ability to directly transmit secret messages over a quantum channel. Unlike most other quantum communication methods, QSDC does not require that the two parties communicating share a private key in advance. Similar to other kinds of quantum communication, the security of the method relies on some of the basic principles of quantum mechanics, such as the uncertainty principle and the no-cloning theorem. As the physicists explain, a quantum memory is necessary for QSDC protocols in order to effectively control the transfer of information in future quantum networks. However, experimentally realizing quantum memory with QSDC is challenging because it requires storing entangled single photons and establishing the entanglement between separated memories. 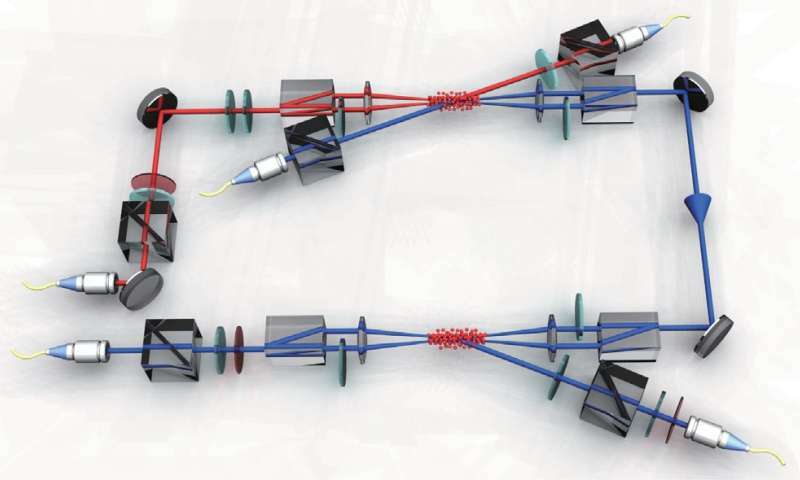 In their experiments, the researchers demonstrated most of the essential steps of the protocol, including entanglement generation; channel security; and the distribution, storage, and encoding of entangled photons. Due to the difficulty of decoding entangled photons in the optimal way (which requires distinguishing between four quantum states), the researchers used an alternative decoding method that is easier to implement. In the future, the researchers expect that it will be possible to demonstrate QSDC across distances of 100 km or more in free space, similar to the recent demonstrations of quantum key distribution, quantum teleportation and entanglement distribution over these distances. Achieving this goal will mark an important step in realizing satellite-based long-distance and global-scale QSDC in the future.